When I make smoothie Popsicles I typically just double the amount of each ingredient and make Popsicles with half and drink the other half. Pretty much any smoothie can be frozen into Popsicles. Chocolate, big surprise, are my favorite. The recipe below is super simple. Feel free to use a different berry or a combination of berries and other fruit (see optional add-ons) to create your own unique Popsicles. If you use a flavored yogurt you might not need a sweetener. Enjoy! Check out my Citrus Smoothie Popsicles for another delicious smoothie Popsicle recipe. 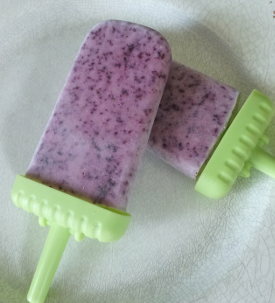 I’d love to know if you try these blueberry yogurt smoothie popsicles and how you liked them. Please leave a comment below. Happy Blending! Just want to say I know from experience how wonderful the wild blackberries are in Michigan. I am from there too. The black raspberries are awesome too! Thanks for the recipes. Can’t wait to try the yogurt smoothie popsicles. Is it true that when you use Maca its help you to increased the size of bottoms? As far as I know Maca doesn’t directly help increase the size of your buttocks. However, it’s best known as an energizer; so it can provide the energy you need to perform exercises that increase the size of your buttocks. Hi,I am going to make this blueberry yogurt smoothie Popsicles soon.I have to go buy some Popsicle molds before I make this recipe. Let me know how they turn out, Kim. Hi Ryan hope all is well. Can you tell me how to speed up my metabolism please.? Here’s a good article on speeding up your metabolism, Netta.